In today’s edition of our Glassdoor Friday we are featuring 15-Minutes Built Up Screen – a unique tool in our derivative analytics product designed to spot price trends in real-time. This screen gives a snapshot every 15 minutes of whether the long or short positions were created in a particular stock or an index. It analyses the open interest (OI) position in real time and gives a breakup of fresh and square-off contracts along with volumes. Short selling is always considered to be a risky bet and retail participants tend to stay away from it. However, using our distinct tool, one can spot where the short or long positions are created in real-time by looking at fresh and square-off contracts along with the movement in price and volume. It not only helps you to make timely entry but also indicates you when to exit from your long or short positions. A conventional trader will look at the increase in OI by comparing it with the previous day’s OI along with the decrease in price to infer that the short positions are being created in a particular counter. 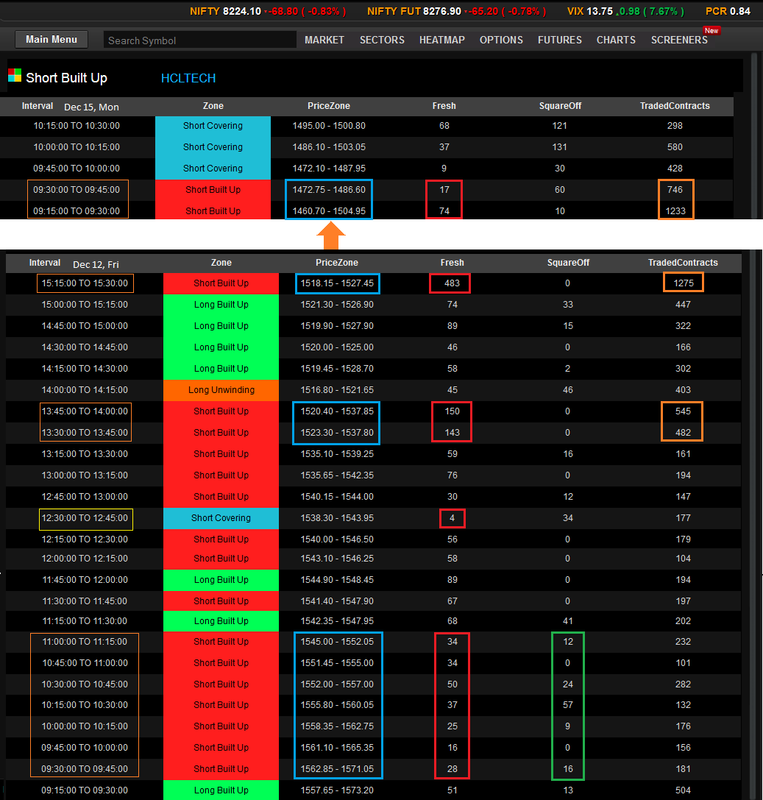 Heckyl’s 15-Minutes Built Up tool analyses the change in OI tick-by-tick in a session (15-minutes) and records how many fresh positions were created or squared off in that interval. It also takes into account the price movement of every tick in the same period along with the volumes to infer various scenarios. Interval: An interval is a 15-minutes session that analyses price, OI and volume. In a trading session, there will be 25 intervals starting from 9.15 am to 3.30 pm. Zone: Zone analyses the data and indicates five scenarios – Long Built Up, Long Unwinding, Short Built Up, Short Covering, Neutral. One should look at zones closely to see whether a sustained buying or selling is happening in a particular counter along with the rise in volumes and fresh/square-off contracts. Price Zone: It indicates the low and high price of a particular counter during 15-minutes interval. Fresh/Square-off: Fresh records new positions that were created today in a particular interval (long or short). Square-off indicates how many positions (intraday/positional) were squared off in the same interval. Traded Contracts: It suggests the volume in a 15-minutes session. A trader should look at volumes closely and see any rise in volumes along with rise in fresh contracts suggesting strong buying or selling. HCL Tech recorded seven consecutive zones of short built-up. Now one should closely look at the fresh and square off positions in the same period. By adding fresh and square off positions and taking the net fresh positions (fresh total – square off total) one can infer whether bears or bulls are having upper hand or not. 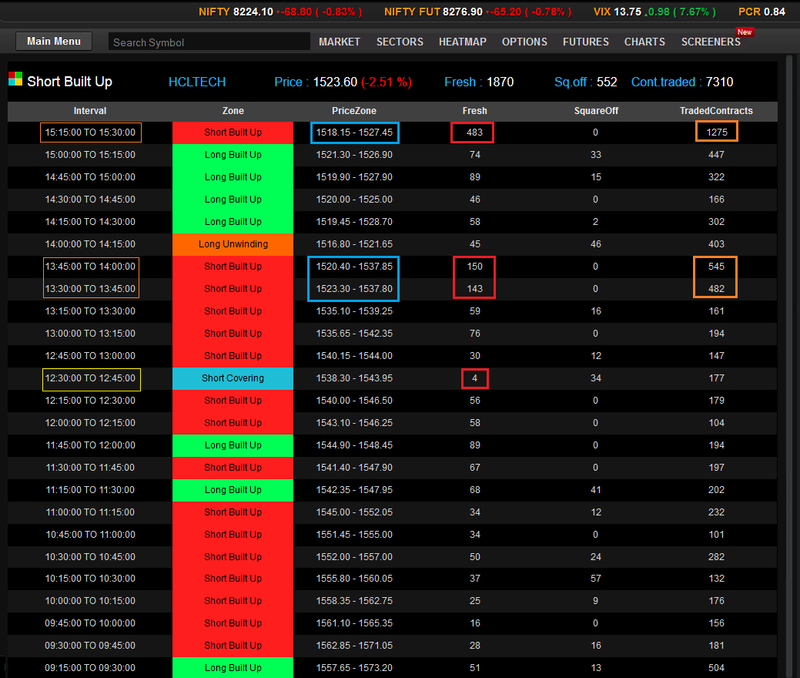 In our case, net fresh short positions of 106 contracts (224 – 118) were created in HCL Tech between 9.30 am to 11.15 am. Also if one looks at the price zone, the future price also drifted lower from Rs 1571 to Rs 1545 suggesting bears are in complete control and one can look to go short in HCL Tech by analyzing this data. As seen from the above graphic, only one zone of short covering was recorded between 12.30 and 12.45 pm. However, there was no follow-up of short covering zones after that interval. Also very few short contracts were covered in that session suggesting shorts are still open in the counter and one can hold on to its short position. Fresh shorts were created in this zone along with the fall in price. One should note that the number of fresh shorts were very high compared to the previous 15-minutes intervals during the day. Also there was a significant jump in volumes as well as fall in price. This indicates more downside left in the counter and one could hold on or add to their short positions. HCL Tech opened 3 percent lower on Monday to touch a low of Rs 1460. Also if one looks at net fresh positions in the same interval, only 21 net fresh short contracts were added suggesting selling pressure is getting moderated in the counter. Also it was followed up by three consecutive sessions of short covering and this might be a good time to book profits. By using Heckyl’s 15-Minutes Built Up screen, one could have taken short position around 1560 on December 12 (VWAP) and booked profits around Rs 1485-1490, netting a profit of Rs 17500. Heckyl strives to make the best analytical tools to help traders and investors take informed and better decisions. Stay tuned to this section for more! This entry was posted in Home, Product Beat and tagged Analytics, Derivatives, F&O, HCL Technologies, Short Selling, Trading.